In this report, we show the organic keywords for which any domain, URL, subdomain (e.g., blog.domain.com) or subfolder (e.g., domain.com/blog/) ranks. Use the drop‐down to select your preferred mode. Below are some actionable ways to use this report. 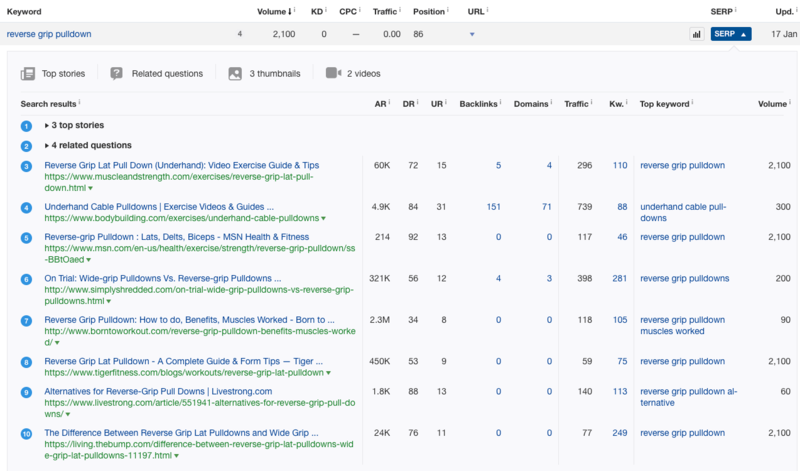 Find out which keywords are sending your competitors the most organic traffic. If competitors are getting lots of traffic from specific keywords, these may be worth targeting too. For example, if we were MailChimp and wanted to see which keywords send the most traffic to ActiveCampaign, we can do precisely that. The report is sorted by Traffic in descending order by default. You can sort by any of the other columns should you wish. Want to exclude branded keywords? Use the exclude feature. For example, we could exclude the words “active” and “activecampaign” from the report above to see cleaner, more insightful data. 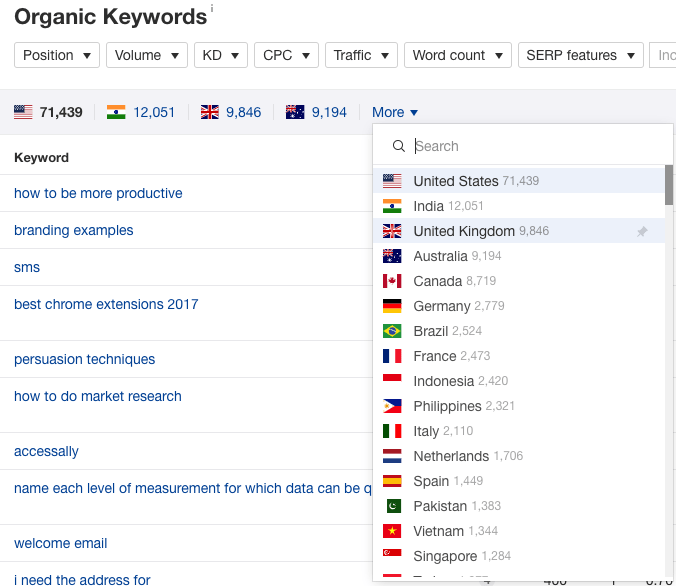 By default, the Organic Keywords report shows keyword rankings in the country for which the target has the most top 100 rankings. Pick a country from the dropdown to see all rankings in almost any other country. For example, if we choose Norway, we’ll see localized rankings and metrics. Looking at your competitors’ top keywords is all well and good, but it may be the case that these keywords are super‐competitive. You can see that although they each have relatively high search volumes, they also have high difficulty scores. Learn more. Luckily, you can use the filters to find low‐difficulty keywords with traffic potential. Let’s set the estimated monthly search to 500+, and the KD score to less than or equal to 10. 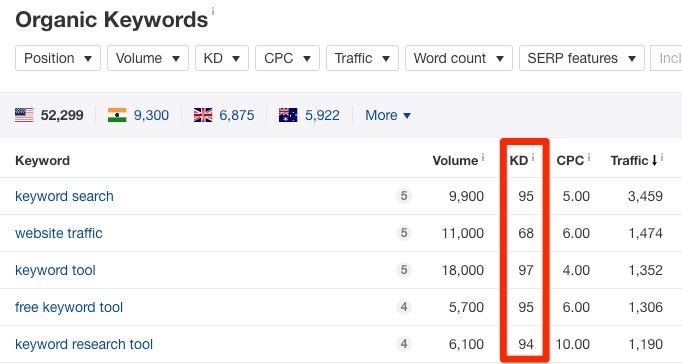 Keyword Difficulty (KD) and search volume can only tell you so much. To better understand the traffic potential and competitiveness of a keyword, you need to analyze the top‐ranking pages. Look at the traffic to the top‐ranking pages to get a sense of how much traffic potential there is for this topic. Traffic numbers in the SERP overview are country‐specific. For example, if estimated organic traffic for the top‐ranking page is 296 (as it is in the SERP above), then that’s the estimated traffic solely from the country for which you’re analyzing keyword rankings. If you see that a competitor is ranking in the top spot for a particular keyword, you may be curious as to how long they’ve held that position. Did they only recently start ranking here, or have they been top dog for a while? To find out, hit the graph icon next to any keyword. This shows their ranking history over time on an interactive graph. 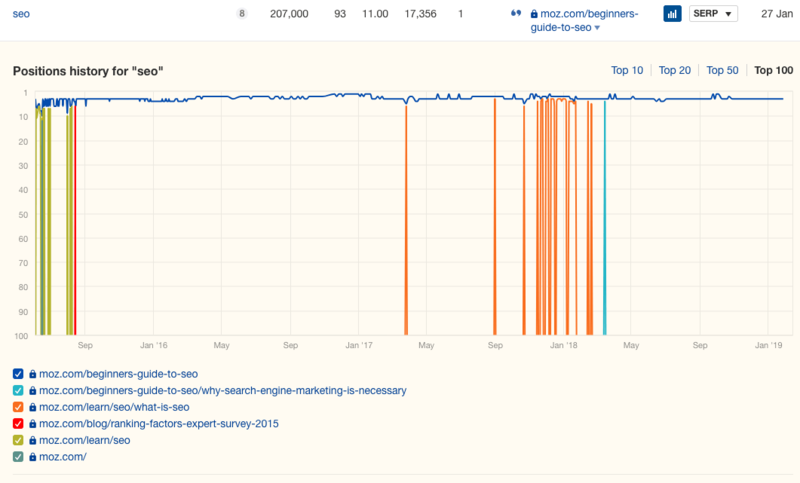 For example, we can see above that Moz’s “Beginners Guide to SEO “has been ranking in the top 5 for “SEO” for years. However, this graph doesn’t only show historic rankings for the current top ranking page, but also for any of the target’s other pages that we’ve seen ranking for that keyword. 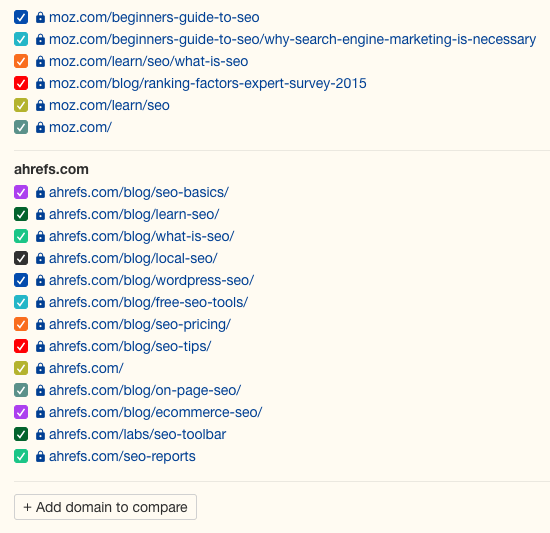 Want to compare one competitor’s keyword rankings to another? You can do that for up to 5 domains. These graphs are useful for understanding whether you’re likely to be able to beat a competitor in the SERPs. If they’ve held the spot long‐term, they may be more difficult to beat. Not only can the Organic Keywords report be used to look at the keywords for which a competitor ranks, but it can also be used to see the keywords for which you rank. And with a few filters, it’s easy to discover low‐hanging traffic opportunities. How so? It’s well‐known that the click‐through rate for first‐page rankings tends to drop sharply. If you then check the SERP Overview for any matching keywords and look at the estimated search traffic to the pages that rank 1–2 positions above you, you can start to get a sense of how much more traffic you could have if you were to increase rankings only marginally. That gets us an estimated 1,081 visits per month from the US alone. However, you can see that the page ranking just one spot higher gets around 75% more traffic.